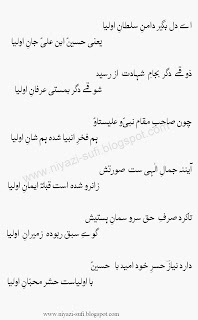 Hazrat Qibla Shah Niyaz Beniaz (R.A.) had great respect and love for Hazrat Imam Hussain (A.S.).He wrote the following Persian manqabat in praise of Hazrat Imam Hussain (A.S.),this manqabat is unparalleled among the kalaams written in praise of Hazrat Imam Hussain (A.S.),either in Persian or Urdu. Hum fakhr-e-Ambiya shuda hum shan-e-Aulia. O heart! Hold the skirt of the emperor of Aulia (friends of Allah). That means Imam Hussain (A.S.) ,who is the soul of Aulia. There is a different ecstasy due to the Divine knowledge available with Aulia. He is the pride of the Prophets ( A.S.) and also of Aulia. He is the reference for the faith of Aulia. This lesson is to be learnt from the life of Aulia. The faith of Lovers of Aulia will be similar to that of Aulia. This kalaam has been sung by various prominent singers. am wondering what should i write? am going alalia. Your encouragement & support is an important part of this work. Such a nice blog regarding Hazrat Niaz (R.A). We read his Kalam here in Karachi Pakistan and I hope it must be performed all over the world.